One of the first points Rinpoche discussed was the importance of not being attached to your own views, and disparaging the views of others. This kind of thinking leads to judging and fixation, which is directly at odds with cultivating a liberated mind and manifesting liberated activity. Eliminating attachment to your own views and eliminating rejection of other views makes you a yogi, he said. Rinpoche then spoke about how to take ordinary activities into the path through undistracted meditation. Specifically, he said that if we are able to remain in undistracted awareness, and self-liberate our thoughts at all times, it doesn’t matter if we are in a cave or the city. Going into solitude can help us to tame the mind, but ultimately we need to maintain the view and the meditation in all activities, in any circumstance. 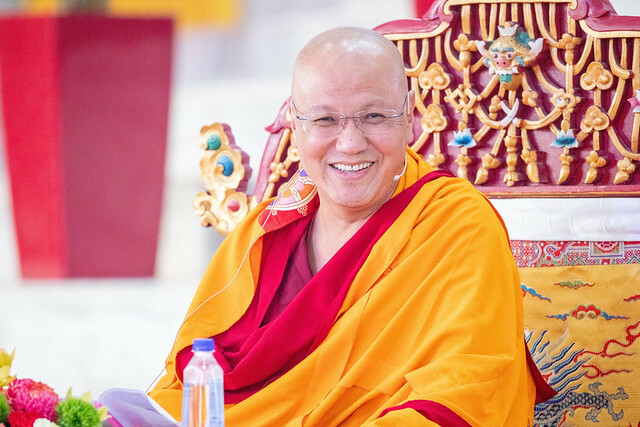 Rinpoche quoted a line from the text which he had also discussed in the morning session: “the luminous essence of your mind; Can’t be obscured by aeons of samsara.” In this case, he emphasized that the luminous essence of the mind exists in all activities and situations; the key point is to not be distracted from it. To illustrate what is meant by non-distraction, Rinpoche gave the example of a herdsman and his sheep. A herdsman is always checking to make sure the sheep are there. Similarly, we should always be checking whether we recognize the luminous essence of our mind. We can do this while we are eating, in conversation, doing any work, or even sleeping. While we are doing this practice, Rinpoche said it is important that you never show others that you are a great meditator. Your conduct needs to be in accord with society and ordinary people. Then, Rinpoche said, “When you are on our own, you are like a tiger leaping.” This is the way of the Kadampas. He summarized by saying the key to conduct is to be unattached. The view and meditation on non-fixation and non-attachment are the aids to our conduct, and help us to not have outrageous conduct. Again, Rinpoche emphasized that it is not important what other people see and view, and what matters is our own experience. During all activities, whether alone or in a crowd, we should practice the meditation and conduct. No one should know we’re doing it. Next, Rinpoche spoke about the importance of being able to check our own experiences with a realized guru. He advised that when problems arise, we should consult a realized guru to check whether our experiences were good or bad. In that way we would develop. Otherwise, we could lose our way. He said this kind of advice is impossible to get from books; it must come from a guru who has realization. Rinpoche concluded the afternoon session by reiterating the key points of how to realize mahāmudrā conduct. First, he said, the guru needs to point out the nature of your mind. Next, we have to cultivate the mind that has no aim. We need to understand this view and cut through our projections. Then we need to become habituated to this view. Rinpoche said, “nirvana means to be unstained.” Being habituated in “no aim” is what is meant by unstained, he explained. In other words, recognizing that relative phenomena are interdependent and do not exist inherently. Understanding this view, meditation and conduct, it is possible to become fully liberated from samsara.